We are often asked, what is toxic to dogs? Some we know about, however, there are many others we are not aware of that are just as dangerous and poisonous to your pet. Click on the boxes below to learn about common foods and plants that are harmful to dogs. Chocolate contains theobromine and theophylline, a naturally occurring stimulant in cocoa beans. This can cause vomiting, seizures, heart problems and even death for dogs. After a dog has eaten a large quantity of chocolate, many dog owners assume their pet is unaffected. However, the signs of sickness may not be seen for several hours, with death following within twenty-four hours. A dog that has ingested a large quantity of chocolate will exhibit symptoms that include staggering, labored breathing, vomiting, diarrhea, abdominal pain, tremors, fever, heart rate increase, arrhythmia, seizures, coma or death. Cocoa powder and cooking chocolate are the most toxic forms of chocolate to a dog. A 20 lbs dog can be seriously affected if it eats 3-5 oz. of unsweetened cooking chocolate. These forms of chocolate contain ten times more theobromine than milk chocolate. Thus, a chocolate mud cake could be a real health risk for a small dog. Even licking a substantial part of the chocolate icing from a cake can make a dog unwell. Semi-sweet chocolate and dark chocolate are the next most dangerous forms, with milk chocolate being the least dangerous. A 20 lbs dog needs to eat more than a 6-9 oz. block of milk chocolate to be affected. Obviously, the smaller the dog, the less it needs to eat. Mushroom toxicity does occur in dogs and it can be fatal if certain species of mushrooms are eaten. Amanita phalloides is the most commonly reported severely toxic species of mushroom in the US but other Amanita species are toxic. Symptoms include abdominal pain, drooling, liver damage, kidney damage, vomiting diarrhea, convulsions, coma, and death. Similar to chocolate, a couple of sips of coffee might not harm your pooch, but ingesting coffee grounds, tea bags or energy drinks with high caffeine content can be deadly for them. As few as a handful of raisins or grapes can make a dog ill; however, of the 10 cases reported to the ASPCA Animal Poison Control Center (APCC), each dog ingested between 9 ounces and 2 pounds of grapes or raisins. Symptoms include vomiting, diarrhea, abdominal pain, and lethargy. 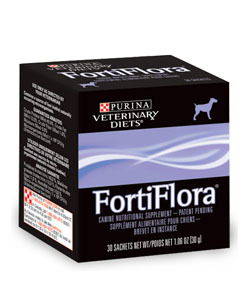 If ingested, it can cause liver damage or kidney failure in dogs. 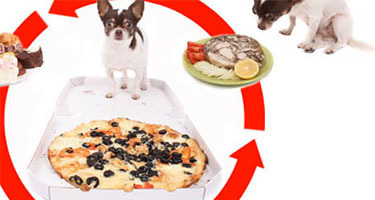 Fat trimmed from meat, both cooked and uncooked can cause pancreatitis in dogs. It is also not healthy for them as it promotes weight gain. Raw Eggs or Meat contain an enzyme called avidin, which decreases the absorption of biotin (a B vitamin). This can lead to skin and hair coat problems. Raw eggs and meat may also contain Salmonella which can result in food poisioning. Macadamia nuts are another concern, along with most other kinds of nuts. 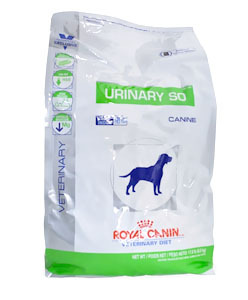 Their high phosphorus content is said to possibly lead to bladder stones. 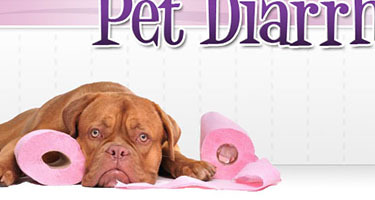 Dogs develop a tremor of the skeletal muscles, and weakness or paralysis of the hindquarters. Affected dogs are often unable to rise and are distressed, usually panting. Some affected dogs have swollen limbs and show pain when the limbs are manipulated. Some baby foods contain onion powder, which can be toxic to dogs. 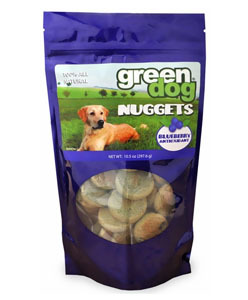 Although most baby food without onion or garlic in it is fine, it is actually low in nutritional value for dogs. If fed as food, it might result in nutritional deficiencies. Onions and garlic contain the toxic ingredient thiosulphate. Onions are more of a danger. Dogs affected by onion toxicity will develop hemolytic anemia, where the pet's red blood cells burst while circulating in its body. Symptoms include Hemolytic Anemia, labored breathing, liver damage, vomiting, diarrhea, and discolored urine. The poisoning in dogs occurs a few days after the pet has eaten the onion. All forms of onion can be a problem including dehydrated onions, raw onions, cooked onions and table scraps containing cooked onions and/or garlic. Left over pizza, Chinese dishes and commercial baby food containing onion, sometimes fed as a supplement to puppies, can cause illness. While garlic also contains the toxic ingredient thiosulphate, it seems that garlic is less toxic and large amounts would need to be eaten to cause illness in dogs. Bones from Fish or Chicken can cause obstruction or laceration of the digestive system. If they get lodged in the intestines, they would need to be surgically removed. Raw Fish can result in a thiamine (a B vitamin) deficiency leading to loss of appetite, seizures, and in severe cases, death. More common if raw fish is fed regularly. Some adult dogs and cats do not have sufficient amounts of the enzyme lactase, which breaks down the lactose in milk. This can result in diarrhea. Lactose-free milk products are available for pets. Although not toxic, the two kinds of foods are designed to be different nutritionally. 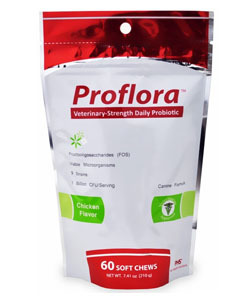 Cat foods are generally high in protein and fats and not suitable for a dog's diet. Xylitol is a sweet, white powder that looks and tastes similar to sugar. It is often used as a sugar substitute in chewing gums, candies, breath mints, chewable vitamins, and other products. Xylitol is safe for humans, but is EXTREMELY toxic to dogs. Even small amounts of xylitol can result in hypoglycemia, seizures, liver failure, or even death in dogs. Symptoms of xylitol consumption appear within 15-30 minutes of consumption, and include vomiting, lethargy, incoordination, termors, seizures, and coma. If you suspect that your dog has consumer xylitol, contact your veterinarian or Pet Poison Helpline (800-213-6680) immediately. Peaches are not themselves poisonous to dogs, although they can potentially cause diarrhea or loose stools. Much more dangerous, however, are the peach pits which contain a chemical called cyanide. 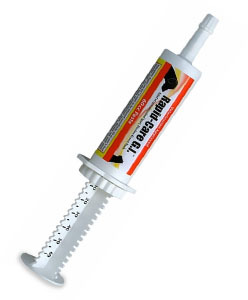 Cyanide is extremely toxic, and can result in hyperventilation, shock, coma, and even death in dogs. Cyanide is also poisonous to humans, and should be avoided. The seeds of peaches also have the potential to cause obstuction in the throat or intestinal tract. Avocados contain a toxin called persin, which is mildly poisonous dogs and deadly for other animals. Avocados can cause intestinal trouble for dogs, and result in vomiting, diarrhea, and lack of stool production. The biggest risk from avocados is that they can cause obstruction if swallowed whole, and the seeds are large enough to block the intestinal tract of smaller dogs. Persin is also deadly to birds and large ruminants such as cattle, and can result in organ failure and death. Jimson Weed is not only toxic to dogs, but at some level toxic to humans as well. 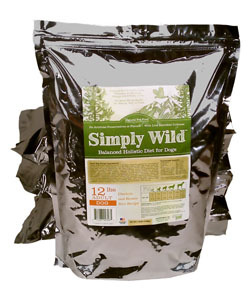 Ingesting any part of the plant can cause rapid breathing, pulse, dilated pupils, twitching and diarrhea among dogs. It can also lead to convulsions, coma or death. One of the most popular holiday plants, it is easily recognizable by their large red, white, pink or mottled leaves. These plants also contain a thick, milky irritant sap. In general, it would take ingestion of a large amount of this plant to see possible clinical signs in your pet. Signs can include vomiting, anorexia and depression. The symptoms are generally self-limiting and treatment is rarely needed. Your Vet may recommend limiting food and water intake for 1 or 2 hours if you pet is suspected of ingesting poinsettias. Lantana is a common perennial flowering plant found in most gardens. The leaves are berries of this plant are poisonous to most dogs. It can cause sluggishness, weakness, bloody diarrhea and in some severe cases even death within 2-4 days if not treated properly. Alcohol can be extremely hazardous to pets, as even small amounts of it can be toxic. When consumed by cats or dogs, it can cause neurological depression, low body temperature, low blood pressure, respiratory failure, and seizures. Beer poses an added threat- as hops, the plant used to brew beer, is also toxic to dogs. Hops can cause hops poisoning, which is characterized by fevers, restlessness, and excessive panting. Another yeast-related product that endangers dogs is uncooked bread dough. The yeast used in bread dough can cause serious problems for your dog�s stomach if consumed. Eating bread dough can cause vomiting, elevated heart rate, low blood pressure, low body temperature, comas, and even death. Raw salt can cause vomiting, dehydration, and tremors when consumed in excess. Your dog should have neither salty foods nor salt on its own; as even salty foods can cause unpleasant effects. If your dog consumes enough salt they may suffer the effects of sodium ion poisoning, which include seizures, coma and death. Mycotoxins can potentially be a severe danger to your pet. Ingesting mold can cause toxicity because the tremorgenic mycotoxins may cause serious symptoms to afflict your dog. Poisoning from mycotoxins can cause vomiting, tremors, and seizures. Similar to peaches, Plums contains chemicals in their pits that can prove toxic to pets. In fact, plum pits contain the same toxic chemical as peach pits, cyanide. If consumed, this can be poisonous to dogs and humans alike.